Catalog 281 (for April) is now available. 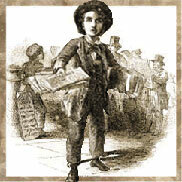 This latest offering of authentic newspapers is comprised of over 300 new items, a selection which includes: a Virginia newspaper with the Suffolk Resolves, the Fugitive Slave Act (in a Washington, D.C. newspaper), a Butter & Bourne newsbook from 1632, a Great Stock Market Crash issue of the New York Times, the famous “Dewey Defeats Truman” headline, a Great Battle of Gettysburg report, and more. Don’t forget about this month’s DISCOUNTED ISSUES. It’s a great day when you locate an issue that someone is wanting, particularly when they really want it. Usually the request begins with, “There’s probably no chance you have this title, but…” Because of our significant database I can now ascertain the general direction a new search will go, and have learned to further diminish expectations with words like, “Well, you are correct — that is a highly desirable date…” Occasionally, my computer will display little notes or other indicators that this is possibly something I (with assistance) can find. Without raising hopes I mention that it doesn’t look promising but there is something I want to double-check before I give a definitive “no”. This morning’s call from one of our cheery customers delivered a query for a Harper’s Weekly from 1863. He was looking for Emancipation Proclamation content, although many collectors want that particular issue for the full page Winslow Homer print or the double-page Thomas Nast “The War in the Border States”. I reverently turned the pages to investigate the text in question, and found it free of foxing or damp stains or tears. And then I found something else. Just beside the historical, monumental words, the Harper’s editor placed or approved a first installment of Wilkie Collins’ No Name. Although I have read his fifth book, I didn’t know that Collins was another contemporary of Dickens and Whitman. I didn’t even know that “Wilkie” was a man. And these little rabbit trails clamored for my attention and had me skimming the assertion by William Makepeace Thackeray on The Woman in White: that it had him “transfixed” – a book that I’d found lengthy and melodramatic upon personal encounter. So, feel free to join the conversation and comment about the amazing things you unexpectedly have in your collection that you never intended to purchase. My own W.C. search is ongoing, as all the commentary I can find is that Collins was serialized in Dicken’s “All The Year Round”, with nary a mention of the great Harper’s. Incidentally, if you are new to this world it might either interest or frustrate you to know the brand encompasses “Harper’s Weekly”,” Harper’s Monthly” (which is also sometimes called “Harper’s New Monthly”), and then the non-newspaper titles of “Harper’s Bazaar” and the various Harper’s books. The Timothy Hughes Rare & Early Newspaper inventory contains the first two titles and it is there I will be searching for Chapter Two. At least, that is how it will begin. Catalog 280 (for March) is now available. This latest offering of authentic newspapers is comprised of over 300 new items, a selection which includes: a ‘Boston News-Letter’ (1740), a ‘Virginia Gazette’ from Williamsburg (1775), a first report of Lincoln’s assassination, a San Francisco newspaper on the 1906 earthquake, a great slave ship print from 1860, a rare Civil War magazine: ‘Soldier’s Casket’, and more. These last few days have been highlighted by fascinating rare newspaper excursions that touched on Johnny Appleseed and hot air balloons and genealogy searches and gold ink newspaper editions and even “mourning rules” (a post-worthy ramble in itself). As this week closes, I find myself musing on all things literary. I recall my first encounter with Walt Whitman’s poetry as being somewhat controversial. Compiling an anthology for a sixth grade project I stumbled across “Song of Myself” and laboriously copied it out onto its own page — carefully fitting text to margins and indents that defined, despite lackluster rhyme or rhythm scheme. Abruptly, I was the focus of adults pontificating on the perils of the modern age and the coming doom symbolized by artists throwing off established norms and strictures. In college, I was perplexed to find that Whitman wrote his grieving “Lilacs” four months after the eloquently detailed sixteen hundred mile funeral procession for Abraham Lincoln. From all the squawking, I had assumed the poet lived in my time, or my parents’ time — not contemporaneously with the sixteenth president. I’m keen on Frost and Dickinson and Oliver and all the greats, but Whitman broke the lingering nursery rhyme cadence of Robert Louis Stevenson with a clear voice of plain-speaking, beauty filled, heartwrenching truth. 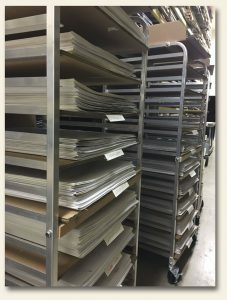 And so, with ten minutes of unscheduled time this week, I delved into the directories of perhaps the largest Civil War newspaper collection in the world, to see what we might have within our archives. 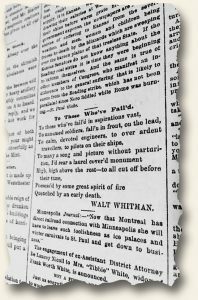 Three years after Lincoln’s assassination, the popular New York Herald was the first to publish the words “…to all cut off before their time, Possess’d by some great spirit of fire Quenched by an early death.” It is signed in block type, “WALT WHITMAN”. And, yesterday, I held it in my very own 21st century hands, looking at this poem irreverently sandwiched between complaints against Kansas senators and the connection of the Minneapolis/Montreal railroad. In 1888 Walt Whitman’s words were taken at face value, distinct from any of the acclamation or aspersion that would come with the passage of time. Reading them, this way, is a little bit like traveling back two hundred years to look at things from a completely different view. Many of you who call or email or write or browse online in search of particular subjects, dates and people are reaching for the insight from the immediate context of newsprint columns, to hear what was once merely words in print, chronicling the events of the day. At any rate, no one can live by poetry alone, so next Friday I am honor bound to tell you of one or two colossal mistakes I have made, and balance this week’s ponderous tone with a humorous tale or two. Things around here are often funny and deep — a little bit like those old, modern poets. Few nations can boast of a peaceful trek from being a slave state (at least in part) to the enslaved people-group holding the highest position in the very land that had once enslaved their ancestors. Whereas there is still much work to be done, the United States’ governmental structure allows, and even promotes such progress. Since much of these historic events were put in print, the link below is able to provide a chronology of many of the highlights of this amazing, albeit bumpy road. Since the link only provides a snapshot of each issue’s content, in order to view the related coverage you may need to click on the item number of several in order to view the item’s full description. Note: While perusing the issues shown in the link above, one might wonder why a link to a chronology of “Black Americana” issues includes those from outside the United States. Answer? Life rarely happens in a vacuum – and this is equally true with the trek shown above. Both the related tragedies, atrocities, and eventual progress which transpired outside the U.S. were often foundational in the thinking of those within. As a result, they have been included. Catalog 277 (for December) is now available. This latest offering of authentic newspapers is comprised of over 300 new items, a selection which includes: a 1774 Virginia Gazette from Williamsburg, Virginia, an American Weekly Mercury from 1736, a Tombstone Epitaph from shortly after the gunfight at the O.K. 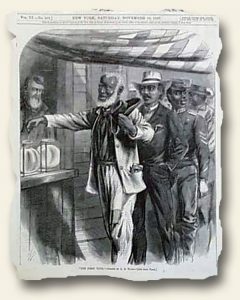 Corral, a rare Civil War “camp” newspaper, the Emancipation Proclamation in a Washington, D.C. newspaper, the Gettysburg Address in a military newspaper, and more. Catalog 276 (for November) is now available. 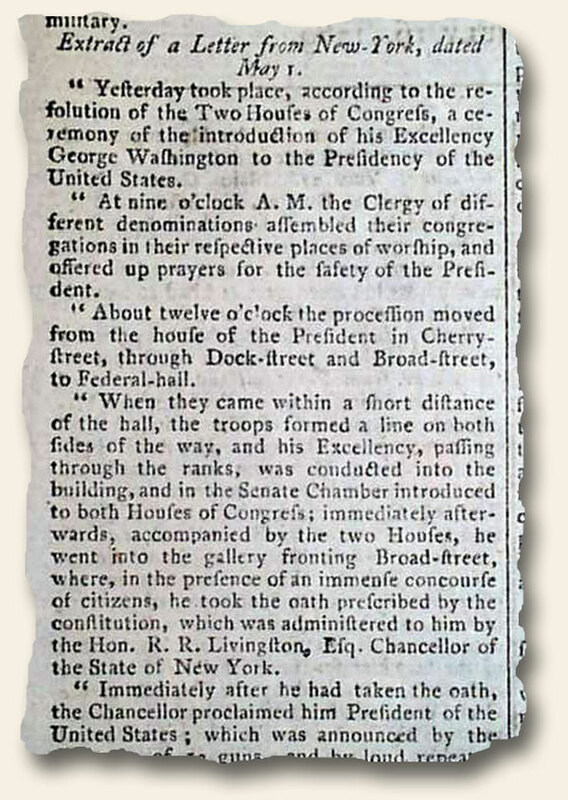 This latest offering of authentic newspapers is comprised of over 300 new items, a selection which includes: two extremely rare 1774 Virginia Gazettes from Williamsburg (one with Boston Tea Party references, and the other with a woman publisher), the “Frederick Douglass’ Paper”, Washington elected President of the Constitutional Convention, The Constitution of the United States, a Honolulu Star-Bulletin reporting the Pearl Harbor attack, an “Oxford Gazette” from 1665, and more. Catalog 275 (for October) is now available. This latest offering of authentic newspapers is comprised of over 300 new items, a selection which includes: perhaps the best stock market crash newspaper, the iconic “Dewy Defeats Truman” newspaper, the Gettysburg Address (from the nation’s capital), a great map of America from 1776, Lincoln’s inauguration and inaugural address, a front page report of Washington’s death, and more. Another special item was added after the catalog went to print, and therefore, is only being offered online: The Virginia Gazette from 1774 which includes reflective thoughts on the Boston Massacre (extremely rare).